9 days travelling across the Baltic States with such a busy itinerary it’s evident that we may only spend a day or two in each country, the capital city always been visited. I’m sure some people will criticise but on such a short amount of time it’s hard to visit the smaller towns and beauty spots without having your own transport. 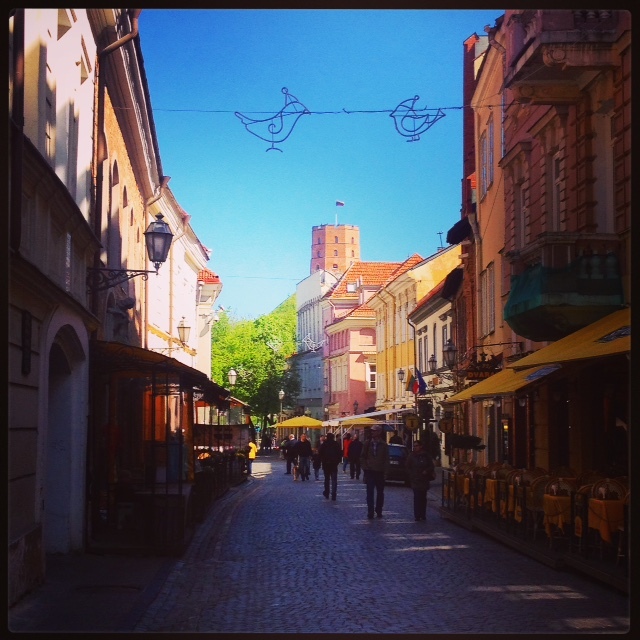 However, on this trip we did take the time to explore Lithuania more than the other countries and so glad we did. The country was just a series of wonderful magical and sometimes somewhat surreal moments. Think it’s safe to say that any guide book you read on Lithuania will be out of date. Firstly, Lithuania joined the euro in January 2015. Also, the issue with taxi’s at the airport being totally corrupt has now been resolved with official taxi ranks, prices are advertised and the airport website even suggests to get a receipt from the driver and if you think you’ve been over charged to email it to customer service, they will investigate and compensate for any loss. 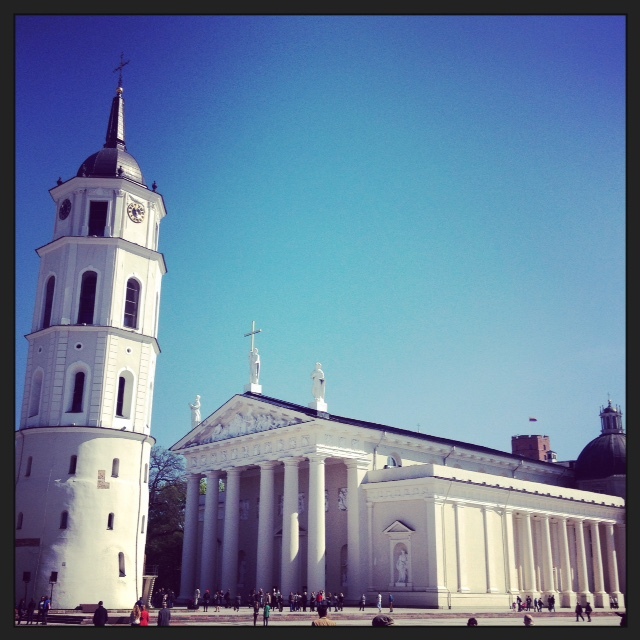 The start of our adventure brought us to Vilnius, the “City of Spires”. There are the usual sights to see – a sprawling Presidential Palace, a vast Cathedral, an Old Town Hall, cobbled streets, Church upon Church, a hill to climb for sweeping panoramic views, you get the gist! The bars are open until 7am, beer is cheap and surprisingly on the weekend Vilnius is not swamped with stag parties as Riga and Tallinn are, nor does there seem to be a boozy culture. Our walk started with stumbling across a film set, which didn’t look too dissimilar to a scene from Les Miserable. Between cuts we were allowed to just walk through the set. For lunch we came across a wonderful International Food Market being held by the Cathedral which wouldn’t have looked out of place at London’s South Bank. Then there’s the Frank Zappa Memorial. Zappa never visited Lithuania…. it’s easy to find with the right directions, but I don’t want to give precise instructions, where’s the fun in that? 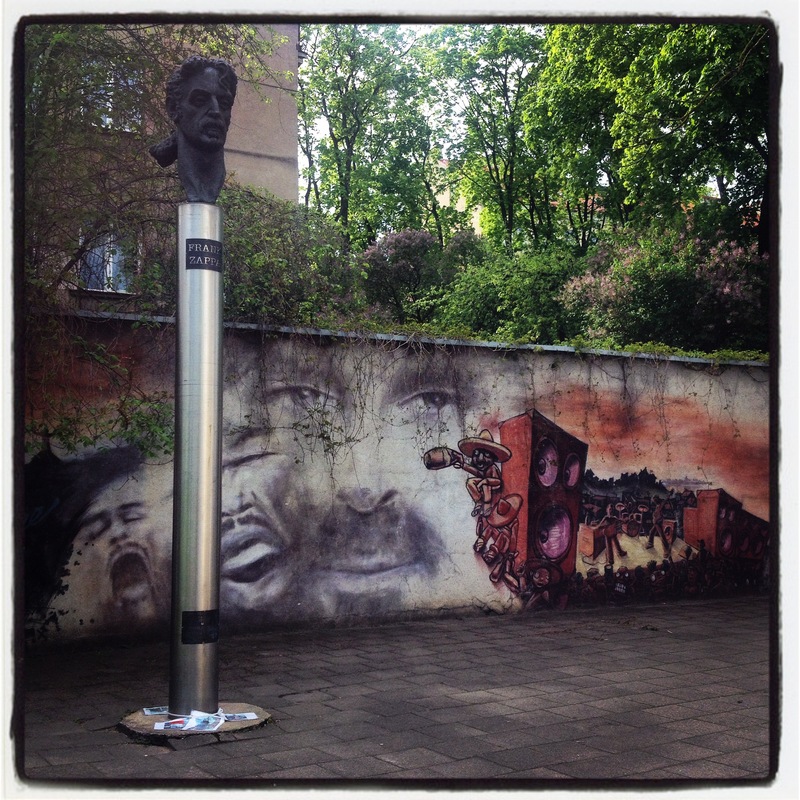 Currently it’s on the end of a pole in the middle of a car park not too far from the The Museum of Genocide Victims…. happy exploring! The district of Uzupis is the main arts neighbourhood in which the residents declared themselves an independent republic. They have their own flag, currency, President, constitution and an army (of eleven). 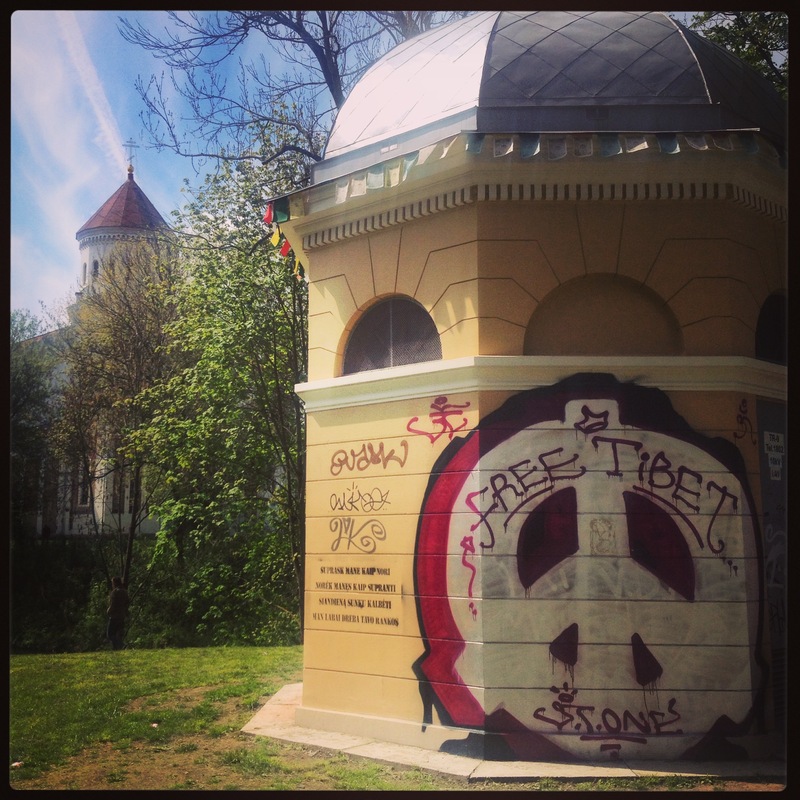 Favourite spots were “Tibet Square” and a statue of the first ever backpacker – “Jesus the Backpacker”. Lovelock Bridges seem to becoming increasingly popular and I have been photographing them across the world over the past few years – a future post I’m sure! 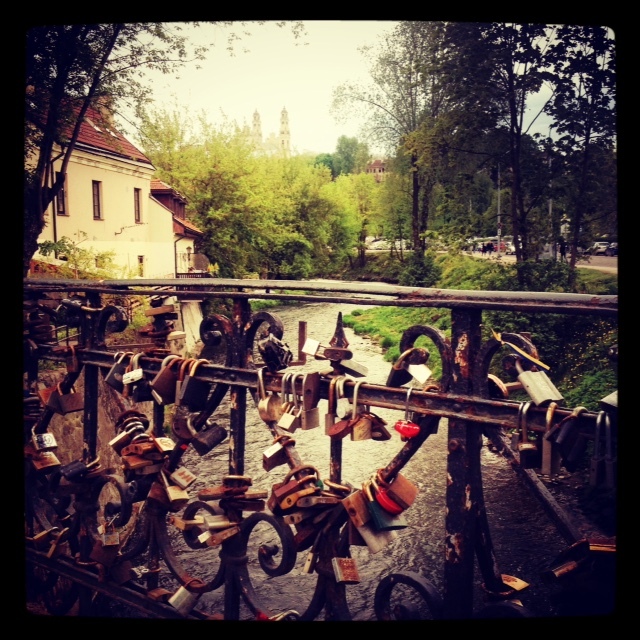 Just as you leave Uzupis you will find one of Vilnius’ spots for young lovers to leave their dedication to everlasting love. Also on the up is “Yarn bombing”…. 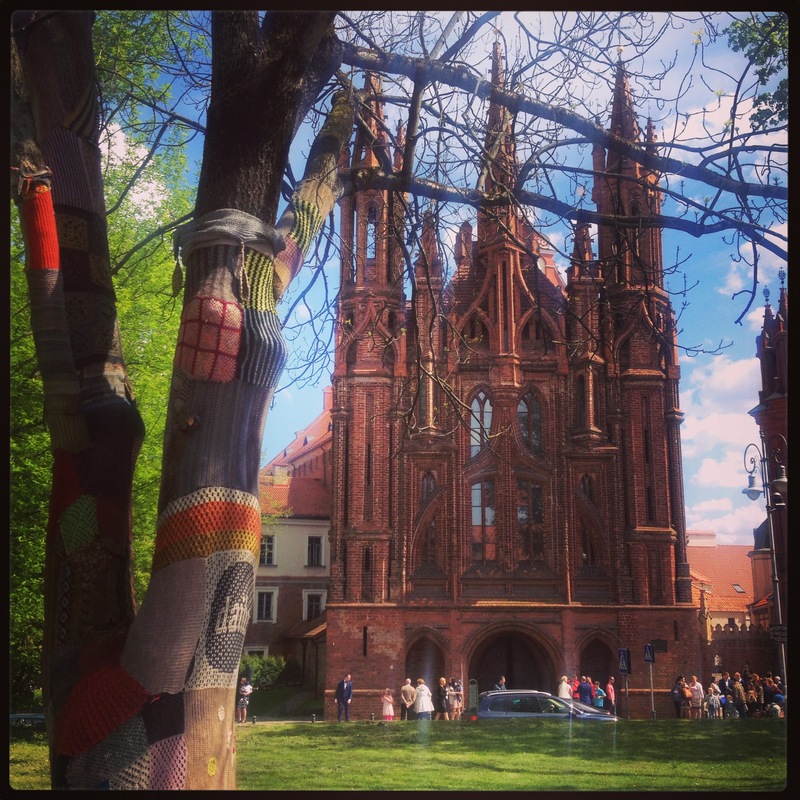 In Vilnius there are several tree trunks wrapped in knitting. It’s considered graffiti and illegal but easily removed and doesn’t harm the trees. Whilst you’re visiting the Cathedral, look out for the slab in the square which has footprints on it [I still haven’t found it! I’m sure someone was standing on it when I was looking]. The footprints mark the spot where the first person stood to form the human chain that spanned across all three Baltic States in 1989. Over 2 million people joined hands in a peaceful political demonstration. Blows my mind! 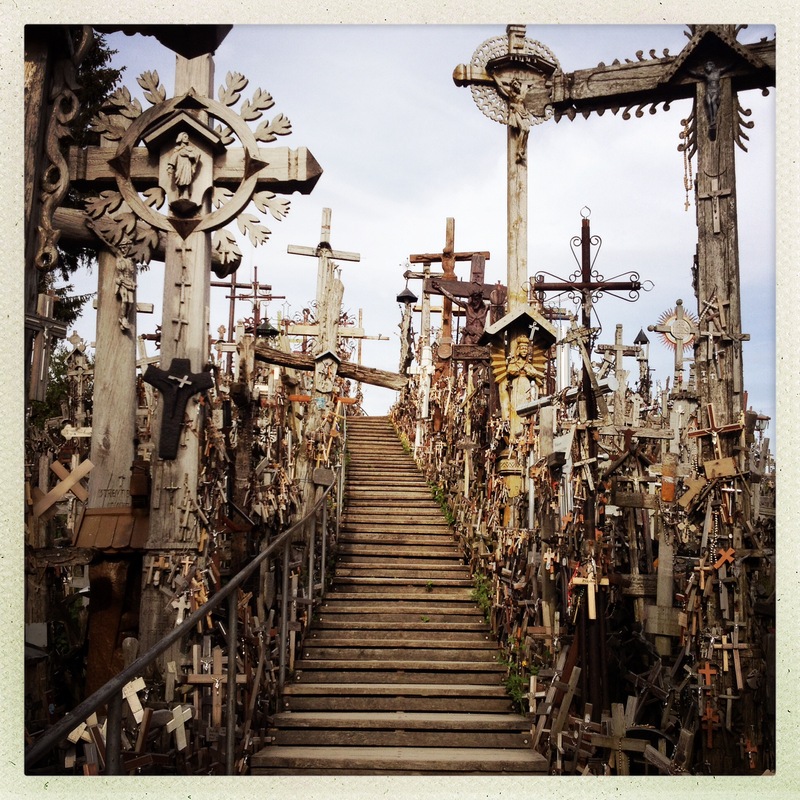 After, take a walk up the hill to The Three Crosses for a wonderful panoramic view of the city. 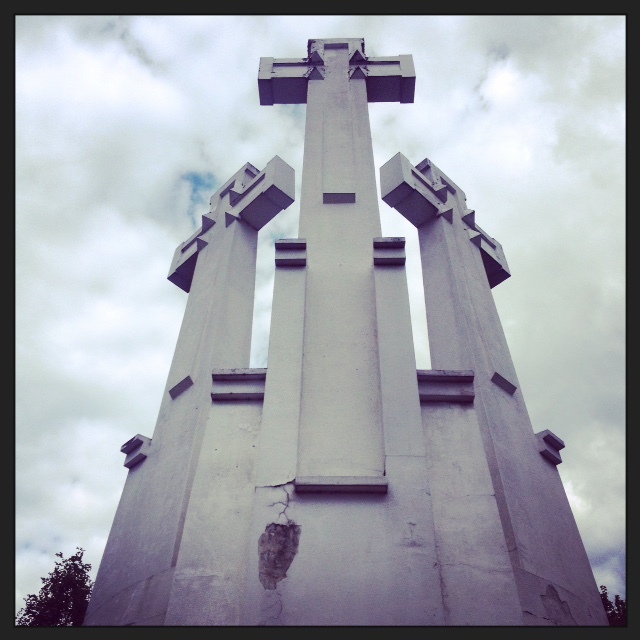 You can still see the base of the original Three Crosses that were torn down during the Soviet rule. Myself and one of my travel companion’s have a reputation of visiting places which are considered “dark tourism”. War torn countries and historical sights which I guess can only be described as places of torture and death. Don’t get me wrong, we’re not into weird stuff, it’s about education and trying to understand historical events which just seem inconceivable. Each of the Baltic capital cities has an ex-KGB headquarter. The Museum of Genocide Victims is housed in the one in Vilnius. It’s extremely informative, if a little over informative – so much to look at that it’s impossible to take all of it in. The most harrowing is the basement torture rooms. I’m sure I don’t need to explain further. We headed back to our apartment to find that there was a rock concert happening right outside our building! I mean, when does that actually happen?? We had planned an early start the next day and a little hesitant knowing that bars are open until 7am. Luckily we are all music fans and they had a curfew of midnight. 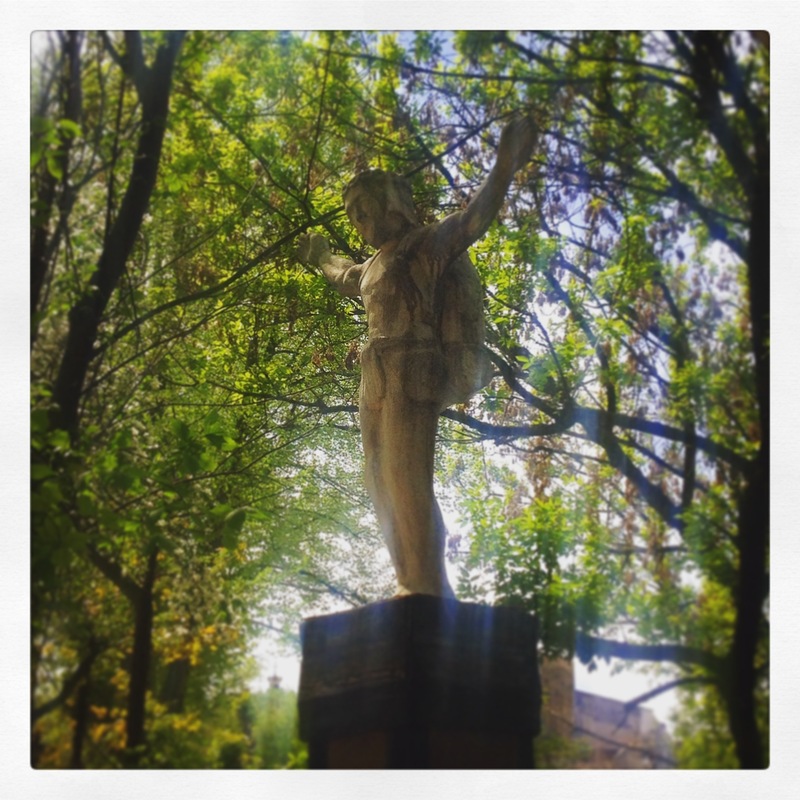 So, if you can’t beat them – join them! 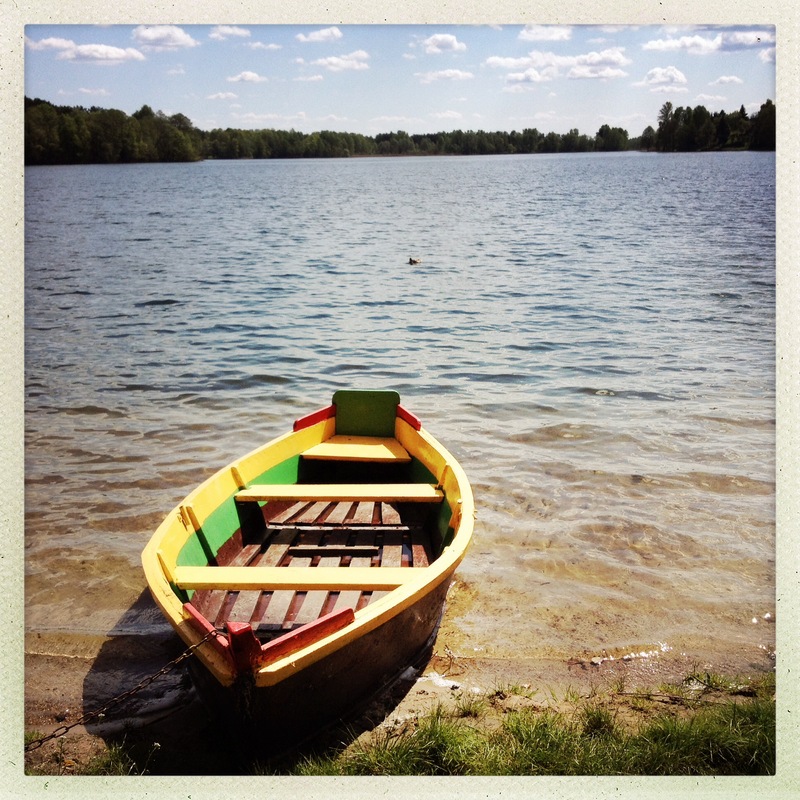 The next day we ventured out on a local bus to a picturesque lakeside town called Trakai. The bus station in Trakai is 2km’s from the main attractions. I think normally you could hire bikes, or even get a taxi but the roads were closed off and army guys dotted about, it all felt a little eerie! Turns out it wasn’t anything sinister when we noticed a herd of runners coming towards us. It was marathon day, and what a setting for it! 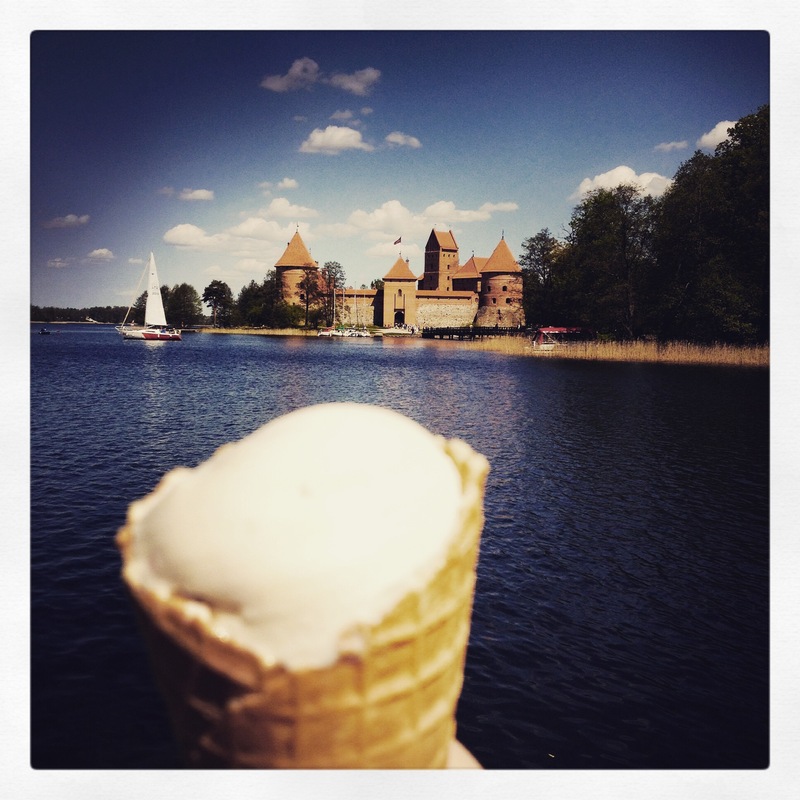 We hired a pedalo, had a picnic on the lake, finished off with an ice cream, will let the pictures show the true beauty. Don’t leave the Baltics without trying the garlic bread! Don’t think of UK Italian style version. Think of heart attack deep fried bits of bread, covered in huge amounts of garlic and sour cream. Pair with a pint of Memelbräu. The ultimate bar snack! 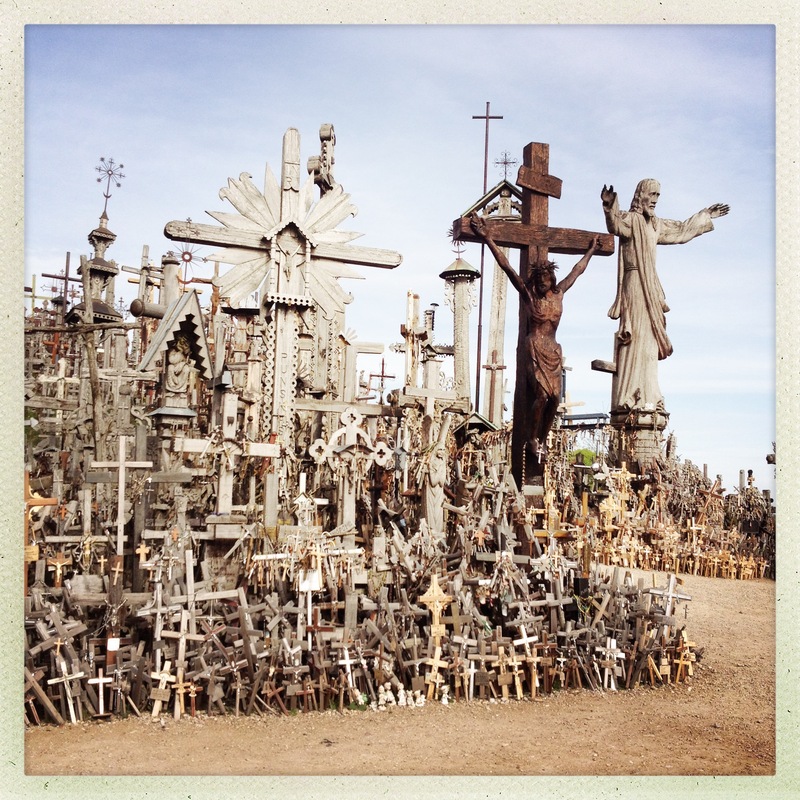 Our 48 hours was over in Vilnius and our adventure to the Curonian Spit was next…..